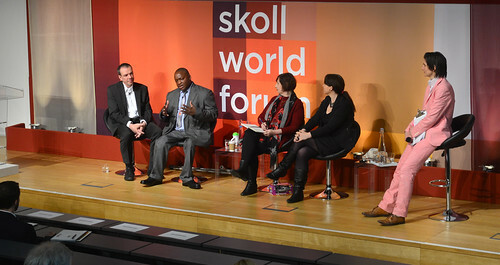 If I could describe in a sentence what the Skoll World Forum is about, it would be: “a bunch of extraordinary people that are working relentlessly to solve the world’s toughest problems.” Taking this as the starting point, I decided to attend this session to see how some of these outstanding individuals are innovating in their fields. The session started with a simple question: what did you want to do when you were 7 years old? Answers in the room varied from “be the President of EVERYTHING” to “be a ballerina.” Jess Search, CEO of BRTIDOC Foundation and moderator of the session, reminded us then of a quote by Oscar Wilde regarding ambition: “Our ambition should be to rule ourselves, the true kingdom for each one of us; and true progress is to know more, and be more, and to do more.” After attending the session I can tell that my own definition of ambition has changed. But, why did this happen? I think a common thread to the speakers and their stories is that at specific moments in their careers they asked a crucial question: why not? The first paintbrush of innovation were the gifts that Jess gave to the speakers prior to the discussion: a model-size car of the famous “Delorean” for Marina Gorbis, from Institute for the Future; a rat-puppet for Bart Weetjens, from Apopo; a toy loud-speaker for Fredrick Ouko, from the Action Network for the Disabled and a small bag with wooden-pieces of London’s iconic monuments for Gabriella Gómez-Mont, from Laboratorio para la Ciudad (Laboratory for the City). To start a session with a symbolic gift to the speakers: why not? Fredrick told that while he was as prepared as other candidates to get a job, he was given only 2 minutes to convince the interviewer to hire him, instead of the 15 minutes given to others candidates. After concluding that his disability was the reason for this, he started the mission of convincing large companies to employ disabled people. The task was not easy but Fredrick took unusual approaches in the process such as to subsidize labor for companies for some months just to show them the value-adding capabilities of disabled people: why not? When Gabriella started Laboratorio para la Ciudad (LabPLC), she invited a diverse group of people with unsual trajectories tocollaborate with the government of Mexico City to build an open collaboration platform. Now, through a series of “experiments” based on the inclusion of different stakeholders, and particularly civil society, they are designing innovative urban solutions. One of the experiments was HackDF, where programmers of the city used existing government data to design apps that solve problems such as long redtape. An open space for civil society to co-create solutions with the government: why not? Marina Gorbis described the case of Freespace, which is a building in San Francisco where people are welcome to go and do something for the space with very basic rules (e.g. no drugs, no dogs) and in the spirit of participation. This “synchronized” action by the community transformed the space radically in just one month, including exterior paiting of the building, a new garden and workshops for homeles people. To “crowd-source” everything for and by the community to create a free space for ALL: why not? Afterwards Marina shared: if awe and emotions are at the core of human beings, shouldn’t we be using and measuring concepts like awe, inspiration and wonder, and not only GDP growth and profit maximization? : why not? Finally, Bart Weetjens told the story of how when he was a child his first pet was a rat and later on his first business venture was to sell baby rats to pet stores. With time he did not only cared and learned from these animals but he got to view them as a “social resource”. One of the things Apopo does is to train rats to detect landmines in countries where they are a barrier to development. Recently, Apopo has gamified its approach to donations by allowing users to adopt a HEROrat, name it, follow its training and track its progress towards its first mine detection. Gamification approaches to attract people towards the goal of saving lives: why not? After this session (and others at the Forum) I now know that the only limits are those that we create in our minds and that true ambition is what makes people change the lives of millions in a positive way. This definition may not last as long as Wilde’s one, but at least it will last during my lifetime.